“Thank you for giving us some hope for the holidays," said a mother of two whose home in Union Beach was leveled by Superstorm Sandy. 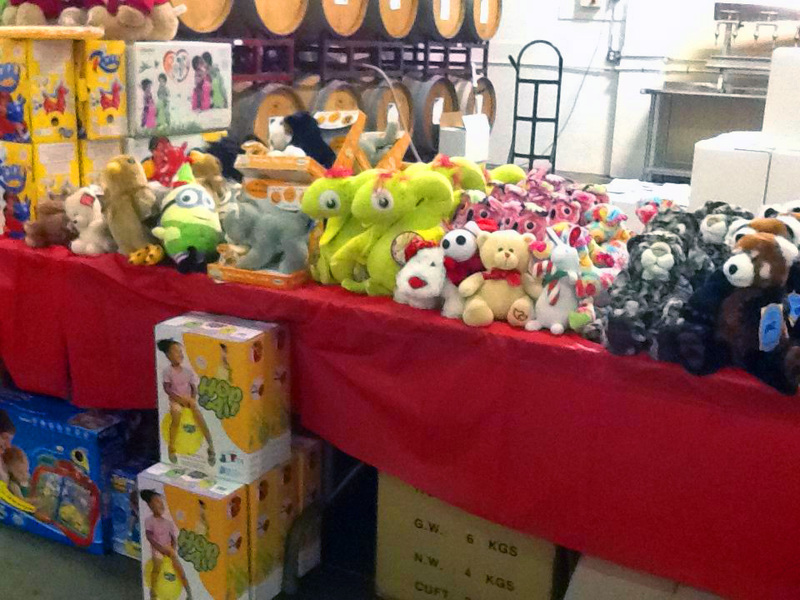 Through four days of laughter, tears and sharing stories, Sandy's Toy Shoppe helped over 1000 CHILDREN who were affected by Sandy. The brainchild of Margaret Spicer, owner of Distinctive Toys in Fair Haven, Sandy’s Toy Shoppe was the successful collaboration of Margaret along with Life Guard Ecumenical Foundation (LGEF), Knights of Columbus of Fair Haven, NJ, and the Junior League of Monmouth County. In early November, Spicer set the wheels in motion by soliciting donations from toy companies and customers to her store. LGEF collected donations on-line via PayPal to buy toys. The Knights secured tables to showcase the toys and the Junior League organized an army of volunteers. Thanks to Frank D’Aponte, owner of Grape Beginnings in Eatontown, NJ, Sandy’s Toy Shoppe found a home for two weekends in December. People affected by Sandy showed their FEMA papers for entry upon which they found an actual toy store where they could choose gifts for their children. Gifts were then wrapped by volunteer “elves”. Compared to the damage done by Sandy in our area, a toy can seem like a small thing, but as we learned, it was the small things that made a difference during those days. Over the course of four days, approximately 300 families shopped for about 5000 toys. The mother who was overcome with emotion when she saw the selection of toys available. After losing her home and feeling so powerless, she couldn’t believe she would get to choose. Neighbors who were seeing each other for the first time since the storm. Both had lost their homes and were displaced. Through tears and hugs, they caught up while their gifts were wrapped. The mother who was excited to find new wooden blocks for her 4 year old son. Building with blocks had been his favorite activity, but they got soaked in the flood and had to be thrown away. The volunteers who came from near and far – NJ, PA, NY – to make the experience for our customers an enjoyable and memorable one. We were very proud to be a part of this amazing event. Life Guard Ecumenical Foundation (LGEF) sends a very sincere thank you to all those who donated toys, money, and / or their time volunteering to make Sandy's Toy Shoppe a huge success. Check out the video of Sandy's Toy Shoppe, courtesy of Distinctive Toys' Facebook Page.